With the heat wave we currently have in Finland (no complain after a long winter! ), I haven’t been baking as much as usual. The fans are on full speed inside the house, so switching the oven on is just not an option. At the same time, it’s blueberry season over here, and forests are full of the gorgeous fresh berries. I picked a big bucket of berries yesterday, and was thinking how to make a pie without any baking or cooking involved, just using raw ingredients. Do you remember the no-bake spicy chocolate ganache tarts I shared some time ago? 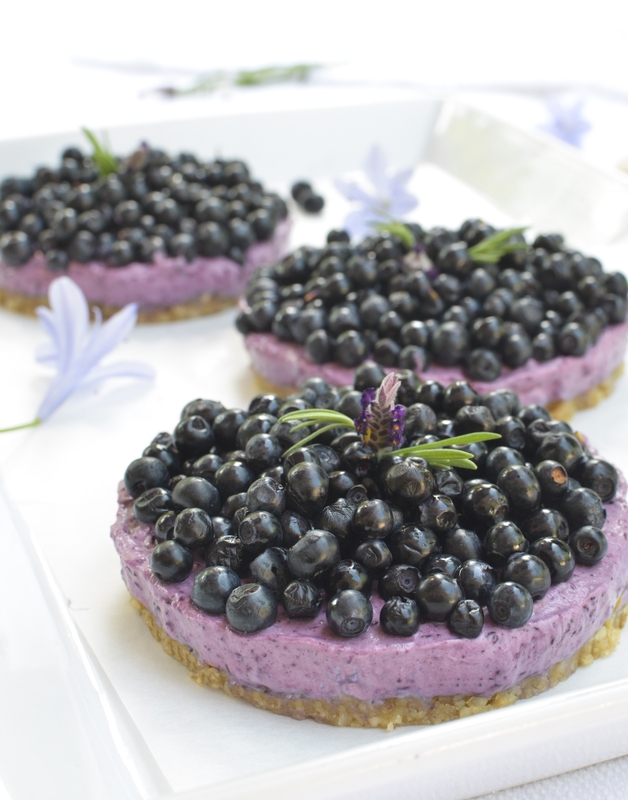 My little raw blueberry tarts are made with a similar crust. I simply grind almonds and cashews, mixed them with soft dates and maple syrup, and used the resulting ‘dough’ as my tarts’ crust. One tip: don’t grind all the way into powder, you want to keep crunchy bits for the right texture. Next, I made a simple blueberry coulis, mixing berries and few spoonful of cream together. The coulis is incorporated into a mix of whipped cream and mascarpone, for a smooth and delicious topping. Perfect for my summer tarts! A generous handful of fresh blueberries as garnish… et voilà! With the quantities indicated in my recipe, you’ll get five littles tarts. I used baking rings (10 cm diameter) to get perfectly round tarts, but you can create the same shape without, and simply pipe your cream on top of the crust. Serve the tarts well chilled, and you will hear a few ‘hmmm’ around the table. At home, this recipe was a big hit! 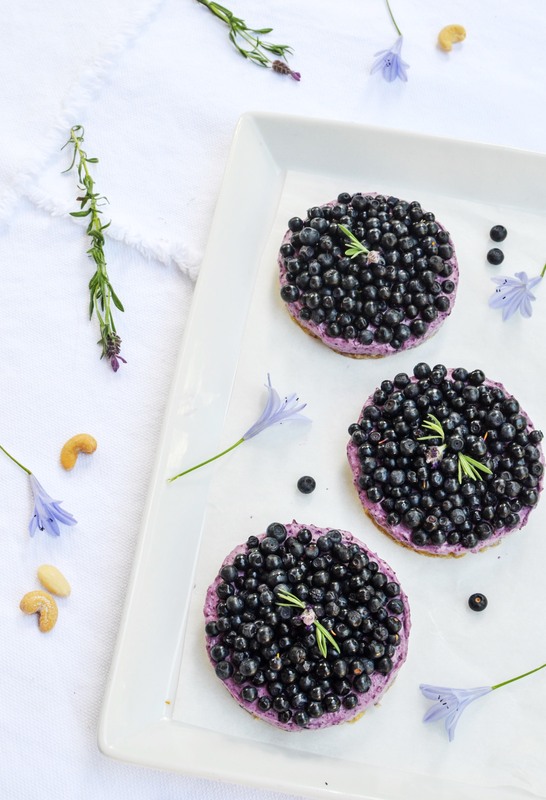 These raw blueberry tarts are a fresh and delicious treat for hot summers, when you don't want to put your oven on. Simple to put together and gluten free! Prepare the crust: Grind the almonds and cashew nuts in a food processor (small bits should remain to give crunch to the crust). Add the pitted dates and a pinch of salt to the mixture (soak the pitted dates in warm water for a few minutes if not soft enough). Keep mixing until a sticky ‘dough’ forms. Press into tart pans, on top of parchment paper. Cover with plastic film and refrigerate. 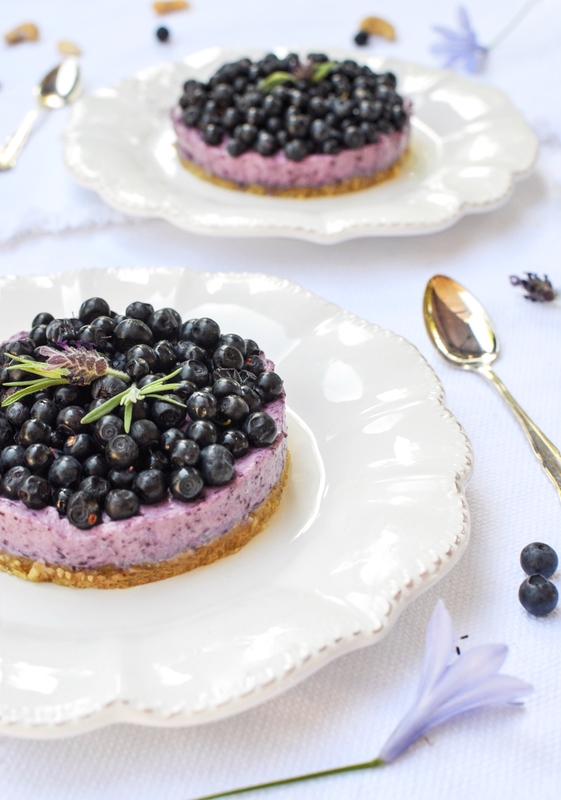 Prepare the blueberry cream: Mix 100 g of blueberries with 3 tbsp of heavy liquid cream to make a coulis. Mix the mascarpone cheese with the confectioner sugar and vanilla powder. Stir in the blueberry coulis. Whip the cream in chantilly and stir in the mascarpone mixture. 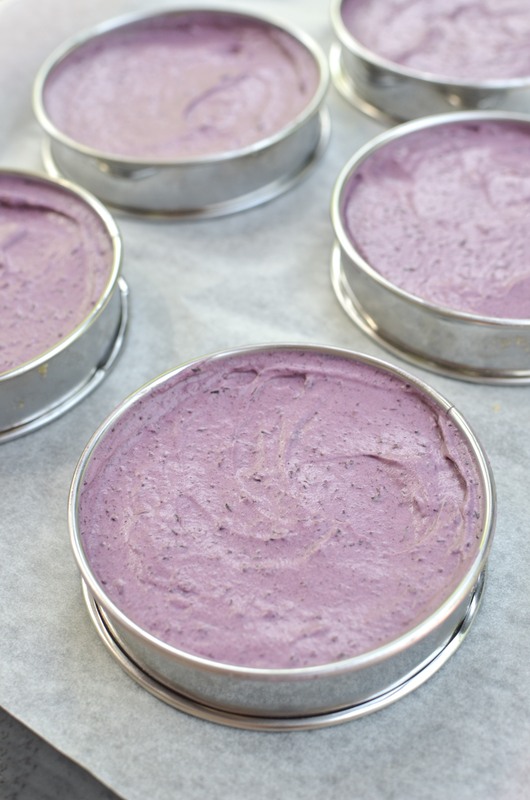 Pour the blueberry cream on top of the chilled pie crusts. 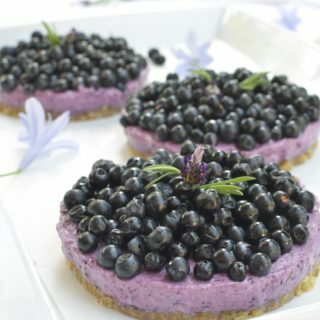 Remove the pans and garnish each tart with fresh blueberries. Préparer le fond de tartelette Passer au mixeur les amandes et les noix de cajou (laisser quelques petits morceaux pour le croquant). Ajouter les dattes (les ramollir quelques minutes dans de l'eau chaude si nécessaire) et la pincée de sel. Mixer pour obtenir une pâte collante. Presser la pâte dans 5 petits cercles à pâtisserie (ou simplement former des cercles), sur du papier sulfurisé. Couvrir de papier film et mettre au réfrigérateur. Préparer la crème de myrtilles: Mixer 100 g de myrtilles avec trois càs de crème pour obtenir un coulis. Mélanger le mascarpone avec le sucre glace et la poudre de vanille. Incorporer le coulis. Monter la crème en chantilly et l'incorporer dans le mélange au mascarpone. Recouvrir les fonds de tartelettes avec la crème aux myrtilles.Retirer les cercles puis garnir généreusement de myrtilles fraîches. Réfrigérer et servir bien froid.